AQUATIC LIFE - 4-STAGE (100 GPD) TWIST IN RO/DI SYSTEM. The Aquatic Life Twist-In 100 GPD 3-Stage Reverse Osmosis (RO) and 4-Stage Reverse Osmosis Deionization (RODI) filtration systems are very compact water purification solutions that efficiently combine reverse osmosis RO and DI technology with our quick and easy to change twist-in replacement filter cartridges. The new twist-in media cartridge design makes filter changes simple, easy and clean no tools required and no mess! The twist-in cartridges can be easily changed in only seconds with just a quarter turn and without contact with used filter material, and the supply water to the unit does not have to be turned off to replace any cartridge. GPD 3-Stage RO System (540370), 100 GPD 4-Stage RODI System (540371). STAGE 1 TWIST-IN SEDIMENT FILTER CARTRIDGE. Recommend replacing every 6 months. The first stage of your RO unit is a 5-Micron Sediment Filter that traps sediment and other particulate matter like dirt, silt and rust which will affect the taste and appearance of your water. STAGE 2 TWIST-IN CARBON BLOCK FILTER CARTRIDGE. The second stage of your RO unit is a Carbon Block Filter. The Activated Carbon in the filter reduces chlorine by up to 99% and conditions the water prior to the RO Membrane. STAGE 3 TWIST-IN RO MEMBRANE FILTER CARTRIDGE. Recommended replacing every 1-2 Years. The RO Membrane reduces impurities known as Total Dissolved Solids (TDS) from the water down to 1/10,000 of a micron, reducing arsenic, lead, parasitic cysts, copper and more. STAGE 4 TWIST-IN MIXED BED COLOR CHANGING RESIN DEIONIZATION CARTRIDGE. Replace filter when resin changes color completely to amber. When all resin has changed color, it is time to replace the DI filter. Small footprint of the unit makes it easy to place under cabinets or in limited spaces. 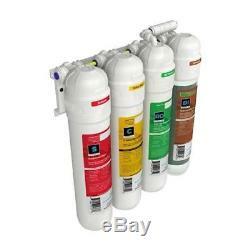 Twist-In cartridges for fast and easy replacement of filter media. Triple-sealed cartridges ensure trouble-free operation. Compact design with pivoting cartridge heads is perfect for small spaces. Mounting Brackets hold the unit securely while mounted in a convenient location. Includes everything for installation: Tubing, Water Supply Connectors, Drain Connector. Our primary warehouses are in PA and AZ. Tracking information is provided with every order. Customers must allow an extra week of processing time for some items. We learned early on that going that extra inch can help your business tremendously. At SaltwaterAquarium we strive to do things different. We aim to keep things simple and only sell products we currently own or have used in the past. We know the products inside and out because, we use them in our reefs/tanks. We should be able to answer any question you have. Setting up our store in this manner makes for a better overall experience for you the customer. Get Supersized Images & Free Image Hosting. Create your brand with Auctiva's. Attention Sellers - Get Templates Image Hosting, Scheduling at Auctiva. The item "AQUATIC LIFE 4-STAGE (100 GPD) TWIST IN RO/DI SYSTEM" is in sale since Friday, November 10, 2017. This item is in the category "Pet Supplies\Fish & Aquariums\Filters". The seller is "saltwateraq" and is located in Gettysburg, Pennsylvania. This item can be shipped to United States, Canada, United Kingdom, China, Mexico, Germany, Japan, Brazil, France, Australia, Denmark, Romania, Slovakia, Bulgaria, Czech republic, Finland, Hungary, Latvia, Lithuania, Malta, Estonia, Greece, Portugal, Cyprus, Slovenia, Sweden, South Korea, Indonesia, Taiwan, South africa, Thailand, Belgium, Hong Kong, Ireland, Netherlands, Poland, Spain, Italy, Austria, Israel, New Zealand, Philippines, Singapore, Switzerland, Norway, Saudi arabia, Ukraine, United arab emirates, Qatar, Kuwait, Bahrain, Croatia, Malaysia, Chile, Colombia, Costa rica, Dominican republic, Panama, Trinidad and tobago, Guatemala, El salvador, Honduras, Jamaica.